Cumin scented lemon chicken meatballs are a gluten-free meal that the whole family will love. While most meatball recipes call for beef or pork, this leaner version is not only healthy but tastes great too. These days, gluten-free products are readily available at your local grocery store. If you cannot find gluten-free breadcrumbs, you can make your own from gluten-free bread in a food processor. These lemon cumin chicken meatballs are delicious atop a bed of fluffy mashed potatoes, rice or quinoa. In a large bowl, add ground chicken, bread crumbs, lemon juice, salt, paprika, cumin, pepper flakes, parsley and half of the sauteed onions. Mix thoroughly. Shape into 1-1/2" meatballs. In a large skillet, heat oil and butter over medium-high heat. Brown meatballs on all sides, about 5 minutes total. Repeat in batches. Transfer to warm plate, cover and keep warm. For topping: Melt remaining butter inskillet. Add remaining sauteed onions, paprika and cumin. 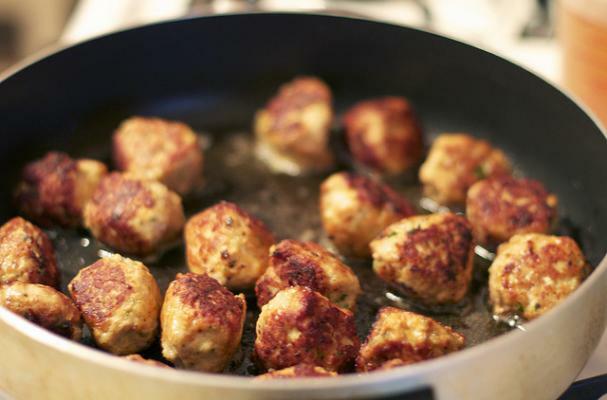 Cook over mediumheat untilwarmed through.Stir in lemonjuice andspoon over meatballs.Serve.